From Rogue One: A Star Wars Story comes the Empire's Scarif Shoretooper! 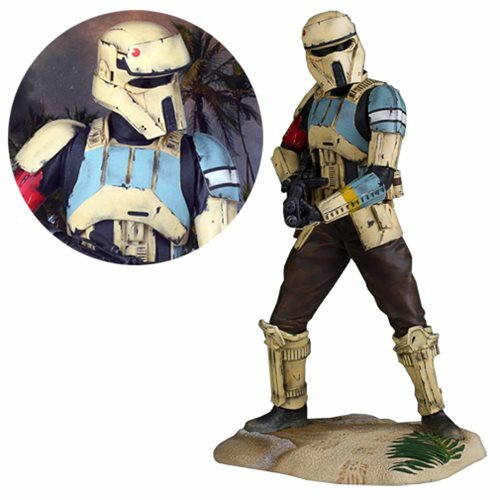 Digitally sculpted and hand painted, this stunning Scarif Shoretrooper features accurate details like rank and insignia applications with battle worn, weathered accents. Cast in high quality poly-urethane, this stunning statue features the captain standing on the shores of Scarif, armed with his heavy blaster. This Star Wars Rogue One Scarif Shoretrooper Collector's Gallery Statue is limited edition and comes individually numbered with a matching certificate authenticity of 1,200 pieces. Measures about 8-inches tall and comes packaged in themed closed box.